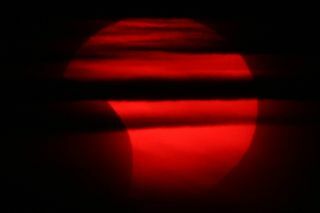 In Bodø, Norway some transparent clouds made the partial solar eclipse of June 1-2, 2011, look more dramatic. Observed with a H-alpha filter, more details on the sun are visible. The rare "midnight eclipse" began on Thursday, June 2, 2011, but crossed the International Date Line to end on Wednesday, June 1. The First Quarter Moon rises around 1 p.m., and sets around 1 a.m. The Full Moon of June is usually known as the Flower Moon. In Algonquian it is called Strawberry Moon. Other names are Honey Moon, Rose Moon, Hot Moon, and Planting Moon. In Hindi it is known as Wat Poornima. Its Sinhala (Buddhist) name is Poson Poya. The Full Moon rises around sunset and sets around sunrise, the only night in the month when the Moon is in the sky all night long. The rest of the month, the Moon spends at least some time in the daytime sky. The Last or Third Quarter Moon rises around 12:30 a.m. and sets around 1:30 p.m. It is most easily seen just after sunrise in the southern sky. This sky map shows how the sun will look during a partial solar eclipse on June 1, 2011. Saturn will by only 15 arc minutes away from the bright double star Porrima (Gamma Virginis). The two nearly equal components of this star are only 1.8 arc seconds apart, and are a test for a 4-inch (100-mm) telescope. This month Saturn has a close encounter with the double star Porrima. Sky Map for the Total Lunar Eclipse of June 15, 2011. The narrow crescent Moon, the planet Mars, and the Pleiades star cluster will form an attractive group in the pre-dawn sky this morning. Sky map for June 28, 2011 of the moon, Mars and Pleiades. Mercury is on the far side of the Sun and not visible this month. Venus, though still bright, is sinking behind the Sun in the east just before dawn and becoming hard to see. Mars is a “morning star” this month. Jupiter is much higher and more noticeable than Venus in the pre-dawn sky. Saturn spends most of the month close to the double star Porrima (Gamma Virginis), prominent in the evening sky. Its rings have returned to their usual glory after being on edge for the last two years. Uranus is in Pisces all month, visible just before dawn. Neptune is a morning object in Aquarius, visible in binoculars or a small telescope.